We want EarBuds to be accessible for everyone and we need your support to reach our goals. Thanks for being an EarBud! Keep on listening! This week, we're checking out 5 podcast episodes on the theme of *Mothers on a Quest,* curated by the super-mother-podcaster, Julie Neale. Neale hosts and produces the Mother's Quest podcast, wherein she inspires, coaches, and creates a community of mothers who strive to live E.P.I.C lives. Neale curated four of the five episodes for this week's theme based on each of the letters of E.P.I.C. The last episode, Friday's, comes straight from the house, Mother's Quest. Listen along with us this week! "E" - "Engage" Mindfully with Our Children by following the example of TiLT Parenting Podcast host Debbie Reber, who discusses the power of a "Growth Mindset" in this conversation with her then 12 year-old-son, Asher. "P" - "Passionate" and "Purposeful" Work - Get fresh insight on pursuing your passion and purpose, and tools for tackling fear with Playing Big author Tara Mohr. "I" - "Invest" in Yourself and your dreams for 2018 by following this reflection and visioning series with Ericka Blocker of the Moms with Dreams Podcast. "C" - "Connect" to a Strong Support Network through the inspiration of the People's Yoga co-founders who bring the power of yoga into their motherhood journey and to building community in their East L.A. neighborhoods. When EarBuds first launched in February 2017, I was six months into a new job in a new town and I was feeling pretty lonely. I live in a small, rural town in the Mississippi Delta and while I love it, I sometimes feel isolated from the rest of the world. Being isolated is going to be great for when we go to nuclear war with North Korea, but it’s not great right now for a millennial trying to stay up on her social justice -- and just all around social -- game. In my Tinder bio, I describe myself as a “northern instigator who can open doors for herself thank you very much.” (This may be why I go on so few Tinder dates). But in any case, a great deal of my friends are baby boomers I’ve met around town. Podcasts keep me sane. They allow me to escape, while simultaneously keeping me connected. The best part of my Monday is opening that EarBuds email and downloading all the new podcasts for the week. I’ve learned so much about things I would have never known existed without these podcasts and the EarBuds community. While filing and making copies at work, I learn about how things are built. During dinner time I listen to stories about the Mothman Prophecies, and in the shower I catch up on what’s happening in the space race. A lot of people, especially in large U.S. cities, find themselves surrounded by people who share their political views. After the 2016 presidential election, we heard a lot about how the news we listen to reinforces itself, that our social bubbles are often filled with people who share our viewpoints on most issues. My experience in Mississippi is different, and for that I’m grateful. I feel very lucky that everyday I work and laugh with people who are different than me. EarBuds’ mission to connect people through stories different from their own challenges me each week when I am introduced to audio that’s outside of my direct zone of interest. I’m also so grateful for my fellow EarBuddies out there who send me podcasts that make me feel seen and ones that challenge how I think. The crowdsourced creativity of our Collective is contagious. We have so much story-sharing power. So far, the Collective has lifted up black voices, women’s voices, immigrants’ voices, disabled voices, and even my own voice! (I curated a list about Mississippi, find it here). I don’t know where the next year will take us, but I’ll be sure to pack my earbuds. For a list of our past theme and pod picks, and even to suggest your own theme, visit our Listening Lists page. This week, we're featuring 5 podcast episodes on the theme *Women in STEM. * STEM stands for science, technology, engineering, and math. Our curator for the week is Jon Menaster, who is also the host of the Read Learn Live podcast. Each episode featured is meant to raise awareness for women in the STEM professions. You can find the email we sent with the podcast suggestions here. Monday's episode is from the Polar Exposure podcast. It's called The Women's Euro-Arabian North Pole Expedition 2018, Episode 10: Team Dynamics. In it, the hosts, Felicity, Asma, and Natasha, all from different corners of the Euro-Asian world, chat about their upcoming journey. 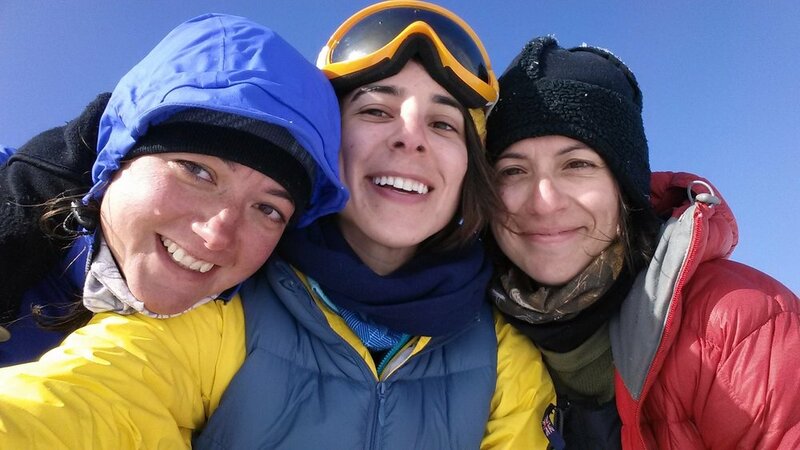 These ladies, along with a bunch of others, plan to ski across the North Pole. Obviously, this requires a lot of preparation, so the group meets in a different city every few months to bond and plan. You can learn more about their plans through Facebook, Twitter, and you can support them here. Tuesday's episode is from the Read Learn Live podcast. It's called Jill Tarter and The Search For Extraterrestrial Intelligence – Ep 26 with Sarah Scoles. In it, Jon Menaster, also our curator for the week, interviews Sarah Scoles, a Denver-based freelance science journalist and contributor at WIRED Science. Sarah is the author of Making Contact: Jill Tarter and the Search for Extraterrestrial Intelligence. Sarah's new book is part biography, part science/learning experience. In this episode, Jon and Sarah discuss SETI, the search for extraterrestrial intelligence, and Jill Tarter's contributions to the field. You can find Sarah's book here. Wednesday's episode is from the Superwomen in Science podcast. It's Episode 9: Learning Science with Dr. Dana Miller-Cotto. In it, hosts Cordon and Nicole, current grad students, talk about science education. They interview Dr. Dana Cotto, a learning scientist who works with math and science learning. You can learn more about this podcast and the work they do on Facebook and Twitter. Thursday's episode is from the Femmes of STEM podcast. It's called Episode Nine: Planes, Motorcycles, & Automobiles. In it, host Michelle Barboza-Ramirez interviews aerospace engineer Stephanie Evans about the long-ago femme of STEM, Beatrice Shilling, an engineer from the U.K.
Find out more about this podcast on Facebook, Twitter, and Instagram. Friday's episode is from the Beyond the Microscope podcast. It's called Episode 40: Between a Rock and a Hard (Water) Place. In it, hosts Lindsay and Mumu chat with Dr. Megan Sebben, a project officer at the Commonwealth Scientific and Industrial Research Organisation (CSIRO). They talk about water shortages, climate change, and science communication. Learn more about the podcast on Facebook and Twitter. We send a weekly email with a theme and 5 pod episodes on that theme. Each week is curated by a different person. Since we started in February of 2017, we've had FORTY unique curators and FORTY-SIX unique email themes. We've learned so much from these podcast episodes and we so appreciate the hard work that podcast hosts and producers put in to create this content. Since we started sending out our email on February 13th, 2017, we've grown and grown. We send out our emails every Sunday night and then post the episodes on Facebook, Twitter, and Instagram. We also are syndicated on DiscoverPods and then we re-post on Medium. Starting now, we will produce our own commentary on the EBC Blog. In addition to pod tidbits on the episodes that are chosen by our curators, we'll blog some extra content for y'all. Stay tuned! Thanks for joining the Collective! Sign Up to Receive our Weekly Email!